COMPANY PROFILE Vedanta Ltd along with its subsidiaries is a diversified natural resource company engaged iron ore mining, non-ferrous metals (copper and aluminium production) and commercial power generation. Vedanta Ltd, formerly known as Sesa Sterlite, is focused on zinc, lead, silver, aluminium, copper, iron ore, oil and gas, and commercial power. The company has operations across India, South Africa, Namibia, Ireland and Australia. The copper division has smelting and mining operations across India and Australia, and as the largest custom copper smelter and copper rods producer in India, it contributes more than half of the group’s revenue. Vedanta is also the largest aluminum producer in India, with operations in Korba, Jharsuguda, and Lanjigarh, generating roughly a fourth of group revenue. The company has iron ore mines in Goa, and is engaged in exploration, mining, and processing of iron ore, pig iron, and metallurgical coke and power generation. 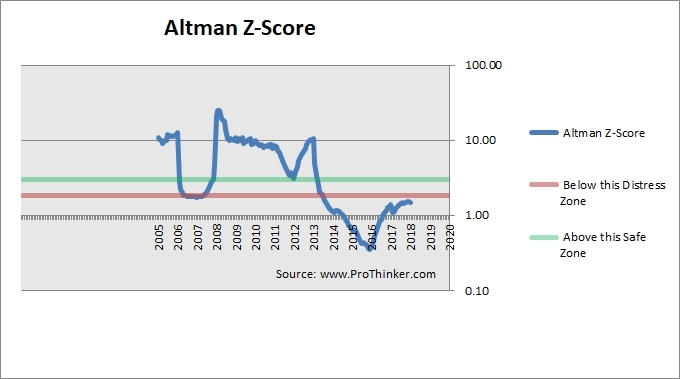 * lower revenue as a proportion of total assetsThe latest Z-Score of the company as at Mar 2018 was 1.5, which is in the distressed zone. 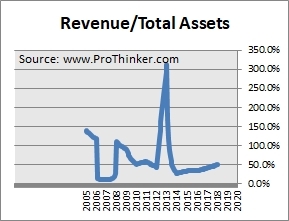 The amount of revenue generated from assets has been on an uptrend since 2014. 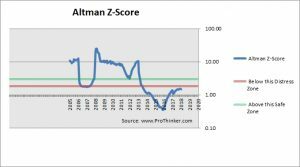 The level of retained earnings relative to assets has been on a downtrend since 2009. 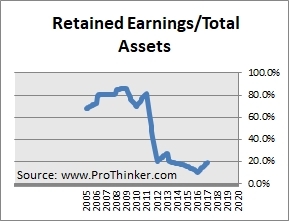 Currently, retained earnings are at 19.3% of total assets. 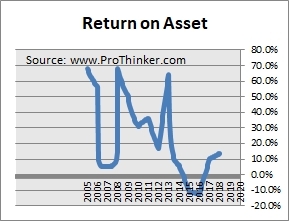 EBIT as a % of assets has been on a downtrend since 2008. 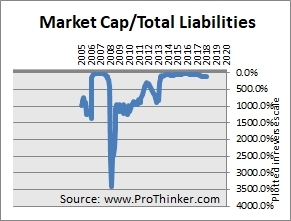 Currently, EBIT is at 13.7% of total assets. Working capital is essential to the operations of the company and a low level of working capital may result in liquidity problems. 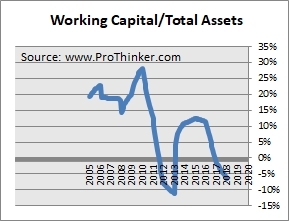 Working capital relative to total assets has been on a downtrend since 2015.